Our New Crypt Has Opened! We all thought our old "digs" were looking rather... dead. So, we thought we'd wipe away the cobwebs and make this crypt feel a like new again! We hope you like it! 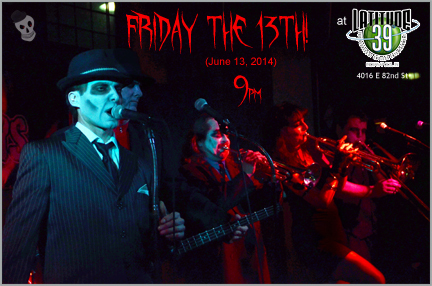 Come celebrate this infamous date with a hearty dose of The Graveyard Stompers! Expect new tunes and old favorites. Bring a mob. We are ready to STOMP! 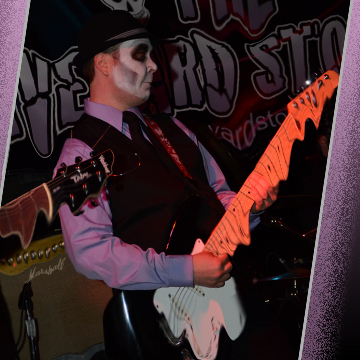 The Graveyard Stompers are looking forward to rocking all you Gravediggers in 2014! Perhaps it is the increasingly long nights, perhaps it is the hard chill in the air... whatever it is, it has sent The Graveyard Stompers into a highly energetic and creative state. After many crazy nights of experimentation, we have come up with several deathly delicious concoctions for our new set of Creepy Cocktails! We will be sharing them all here with you soon. Also, the new tunes are pouring out of us like screams from #22. Really good stuff! We are looking forward to bringing all of these to you very soon, too! Enjoy this cold, dead winter! We are! The Graveyard Stompers would like to thank all our faithful Gravediggers (and also the newly unearthed) who followed us throughout this most excellent of seasons! We are now (de)composing new material and are anxious to rise up again soon. Happy Halloween, and...scare ya later! Our favorite season is here! Are you ready? We are! 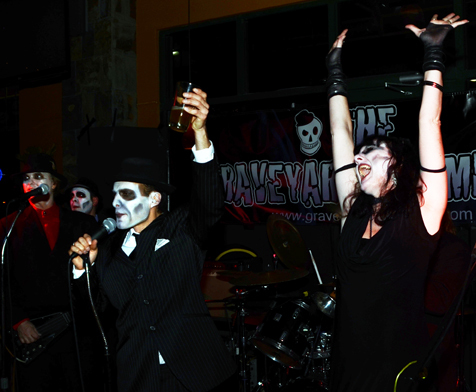 Don't miss The Graveyard Stompers October shows! We've got some new tunes for you along with your favorites! Shout 'em out! Sing along! Let's get stompin'! Yo HOOOOOO! Download THE PIRATE SONG for FREE! In honor of this Thursday, September 19th, being "Talk Like a Pirate Day", we have decided to offer our Gravediggers a bit of treasure of their own! THIS WEEK ONLY, you can download The Pirate Song from our album, "Who's Got The Mojo". Just click the link below! That's right! The Graveyard Stompers are playing GENCON INDY 2013 ! Look for us Opening Night (Thursday, August 15th) at the Westin Hotel Grand Ballroom 9pm - 11pm! ... but that's okay. We're fleshing out some new tunes for you! In a rare event, The Graveyard Stompers will be appearing in the light of day. Come enjoy the tunes and watch their faces melt off! Stompers to RISE for Memorial Day Weekend! Hey! Would ya look at that! No... the HATS! Look at the HATS! The Graveyard Stompers now have official hats available for purchase. Bring a few extra bucks to PJ O'Keefe's next month (5/24 & 5/25) and put a lid on! Thanks for sending us photos from the Daddy Real's gig! Look for a few live videos coming soon! We're breaking outta the graveyard and heading to Daddy Real's The Place! Join us Saturday, March 2nd at 9pm for some music and madness!!! Come out to PJ O'Keefe's and celebrate with The Graveyard Stompers! Costume contest, prizes, and of course, lots of crazy good music. See you there! 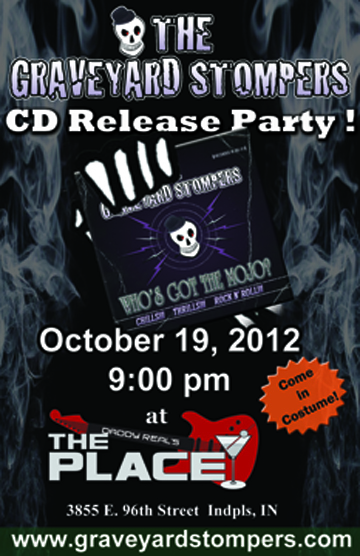 The Graveyard Stompers 2012 Release "Who's Got The Mojo" is ready for you! See you at the CD Release Party this Friday night!!!! Tonight (Friday, Oct. 12, 6-9:30 p.m.) at the Indianapolis Children's Museum! Featuring food stations from area restaurants, spellbinding spirits and beverages, costume parade, games and activities, lights-on and frightening tours of the Haunted House, and your favorite spooky band, THE GRAVEYARD STOMPERS!!! Hey, Gravediggers! Friday night we were invited to play at HorrorHound Weekend. Here is a taste of what you missed. We had a ghoulish good time!